UHP troopers investigating fatal vehicle rollover along SR-30 near the Cache and Box Elder county line. A vehicle rollover along Valley View Highway killed a Logan man. 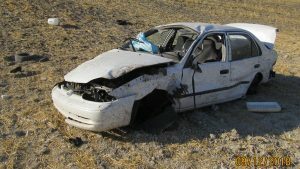 The crash occurred early Wednesday morning near the Cache and Box Elder county line. Utah Highway Patrol Lt. Lee Perry said William Atkinson was driving a Chevy Prism northwest along SR-30. Near milepost 99, the car began to drift off the road, over corrected, and traveled across both lanes of traffic and down a hillside. The car continued into a field where it rolled multiple times, eventually landing on its wheels. Atkinson was not wearing a seat belt and was ejected from the vehicle. He was pronounced dead at the scene. Perry said the car was quite some distance from the roadway and not easily visible. It was spotted by a semi driver who called 911 around 8:15 a.m. Investigators believe the crash occurred several hours earlier though, between 4:30 and 5:30 a.m., but was not visible until sun rise. Investigators believe drowsiness or fatigue likely caused the crash. Perry said they are grateful for the semi driver, who saw something and called it in when he did.